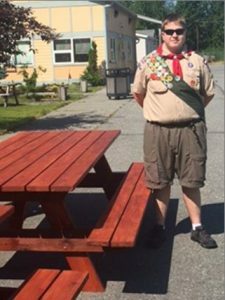 SCF Quyana Clubhouse recently received a donation of three newly constructed picnic tables from Quinn Johnson, an Alaska Native Eagle Scout. Quinn organized a team to fundraise and build the picnic tables as part of a Boy Scouts of America service project that aims to benefit the community. QCH is a safe, welcoming place for Alaska Native and/or American Indian people and community members who are 21 and older with severe and persistent mental illness. With the addition of new picnic tables, QCH members now have an improved area to sit and enjoy the outdoors. Thank you, Quinn and your team, for your hard work and donation!